What impact do schools have on family life? What role do schools play in daily routine? How do schools foster independence? We begin the series by addressing one of the most popular dilemmas parents face: whether to choose a boarding school or a day school. Every school is unique, however here are some overarching practicalities to consider. When families are choosing whether to board or not, one of the first questions they may ask is what it will be like to be apart. Contrary to popular belief, boarding can promote strong family relationships. Living separately during term time can prevent parents and children arguing over everyday matters (room tidiness, homework, bedtime), allowing families to spend quality time together over the holidays.. Regardless of whether you choose boarding or day, it’s important to find a school that reflects your family’s values. Although parents with children at day school will find they have more control over everyday decisions in their child’s life and upbringing, all schools play a huge part in your child’s development. Pastoral care should be central to the ethos of all schools, especially if your child is boarding, with support networks in place to help children grow into happy, confident learners. Parents with busy work lives may find that boarding school offers the best option to give their child the support and supervision they need. Pupils can pursue their hobbies and save time and energy avoiding extensive travel back and forth between various clubs and activities. If your child is at a day school, travel can naturally occupy a substantial portion of your family’s free time. However, it’s likely that you will have more access to your child’s day to day developments at school. These daily catch ups are harder to foster in boarding schools but phones and Skype sessions can help! At boarding school, children experience a fully immersive education both inside and outside of the classroom. Pupils who board have the opportunity to gain life skills out of traditional school hours, preparing them well for independent living at university and beyond. Day school pupils on the other hand are responsible for organising their own schedule, which can help them to strike a good work/life balance in the future. 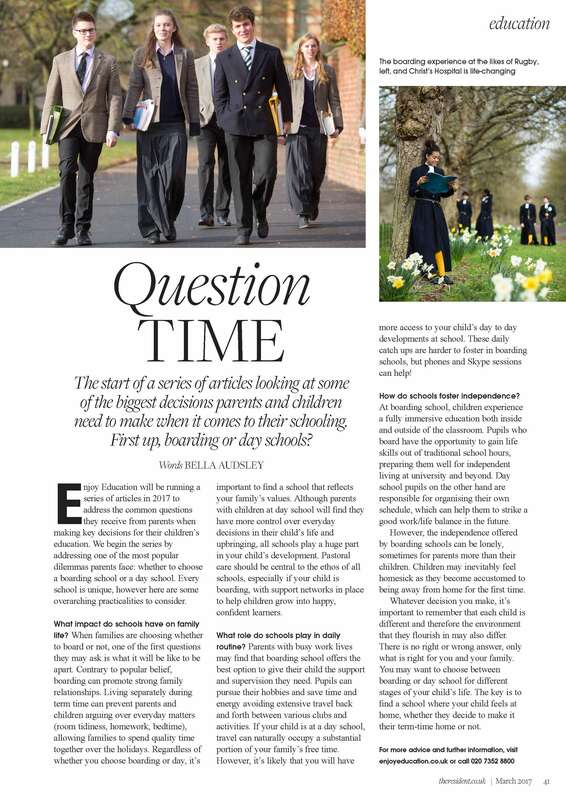 However, the independence offered by boarding schools can be lonely, sometimes for parents more than their children. Children may inevitably feel homesick as they become accustomed to being away from home for the first time.